Volvo vowed Thursday to develop the first kangaroo detection and crash-prevention system, a move which would make for safer travels but fewer collisions to repair across Australia. “The human cost of serious injuries and fatalities from animal collisions is incalculable,” Volvo wrote in a news release. 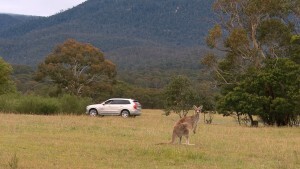 Volvo experts this week arrived in the Australian Capital Territory to study the animals roadside at Tidbinbilla Nature Reserve near Canberra and refine a radar/camera detection and auto-braking system. “Whereas Volvo Cars’ Pedestrian Detection technology is geared towards city driving, our kangaroo detection research is focusing on highway speed situations,” Volvo senior safety engineer Martin Magnusson said in a statement. “Kangaroos are very unpredictable animals and difficult to avoid, but we are confident we can refine our technology to detect them and avoid collisions on the highway. The technology, which Volvo calls an offshoot of the human and vehicle-detecting City Safety, seems ripe to convert for American roads and their deer, and Volvo’s been working on that too. The insurer estimated 1.25 million claims last year involving the three animals, which means we’re talking a few billion dollars in claims and repairer work which could be saved by a solid animal collision avoidance system here. However, the system also will likely make the vehicles which do crash more expensive to repair. Volvo describes a combination of a radar sensor in the grille and — glass installers take note — a “very advanced light-sensitive, high-resolution camera in the windscreen.” Bang those up in a frontal collision, and it means not only more expensive parts but also more electronic calibration time.